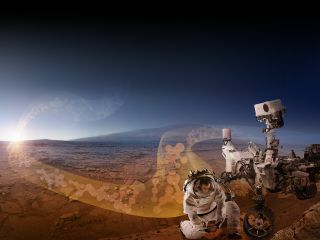 A new NASA report aims to help reduce the threat of contamination of Mars and other worlds during crewed space missions. Future astronauts may return to Earth with valuable samples of Mars. However, space agencies face a daunting challenge — they have to both protect life on Earth from potential aliens and defend potential aliens against contamination from Earth. Now scientists have identified 25 gaps in knowledge when it comes to limiting interplanetary contamination by human crews during future space missions. NASA, with international and industry partners, is developing the capability to take humans deeper into space than ever before. For instance, the agency aims to have astronauts bring pieces of a captured asteroid back to Earth from lunar orbit in the 2020s, as part of an effort called the Asteroid Redirect Mission. And crews returning from Mars could bring back samples collected by the upcoming Mars 2020 rover mission. "The benefit of having humans in space is that they're much more flexible than robots, but they could contaminate Mars with Earth life," said Catharine Conley, NASA's planetary protection officer. Although there are detailed planetary protection requirements in place for robotic missions to the moon, Mars and other celestial bodies, there are currently no such requirements for human missions to Mars. More than 100 researchers held a three-day workshop in 2015 to help lay the foundation for such requirements. The researchers identified 25 gaps in knowledge when it comes to preventing interplanetary biological contamination during human space missions. These gaps fall into three overarching areas: monitoring microbes and human health; investigating how contaminants might travel to, from and on Mars; and technology and strategies for controlling contamination. When it comes to monitoring microbes and human health, knowledge gaps include knowing what technologies and procedures astronauts should use to collect and analyze microbes in a way that protects the human crew and limits risks posed to both Mars and Earth. The researchers also noted there are knowledge gaps when it comes to options for diagnosing and treating crew exposures to microbes, and on effective, safe microbial disinfectants. "A really interesting development that came to light was all the work done in the biomedical community to investigate the human microbiome and environmental microbiome — what microbes live in people and their environments," Conley told Space.com. "Ten years ago, the technology to analyze these microbiomes was not well-established, but now there are devices on the International Space Station with microbial monitoring capabilities." When it comes to investigating how contaminants might travel to and on Mars, knowledge gaps include learning how Martian winds might potentially disperse microbes and other contaminants and pose risks to human health. Moreover, it remains uncertain how the harsh conditions of Mars may or may not limit the spread of very hardy microbes that might get transported around during human missions. "Recent findings that are coming back from the robotic rovers we have on Mars are giving us hints that the Martian environment is not understood in detail to the level we would want," Conley said. "For instance, bleach flying in the dust in Mars is potentially a human health hazard." When it comes to technology and strategies for controlling contamination, knowledge gaps include how the duration of the human stay on Mars might impact risk of contamination and what level of escape of microbes into the Martian environment might be acceptable, given how many would likely die out. "The capabilities we are developing for people for the Asteroid Redirect Mission are good testbeds for ones we can develop for Mars," Conley said. By closing these 25 knowledge gaps, "we will be able to establish clear quantitative guidelines on planetary protection that will lead to eventual international consensus standards for human missions beyond Earth orbit and particularly in support of a collaborative journey to Mars," Gerhard Kminek, the European Space Agency's planetary protection officer, said in a statement. The scientists detailed their findings Nov. 2 in a report that summarized the 2015 workshop.